When buying your first house, it can feel like a whirlwind. Of things to learn, things to consider and analyze, and a mixed bag of emotions to boot. It’s exhilarating. It’s nerve-wracking (as you eagerly await the reply of the seller). It’s every emotion you can feel. But equipped with the right team of agents and the right resources, those nail-biting moments can leave you feeling cool, calm and collected. As a leading real estate team in the Dallas-Ft. Worth metroplex, we have seen and been a part of many first time home buying purchases. What we’ve learned about the not so obvious things to look for in the house can now help you through YOUR first time home buying experience. 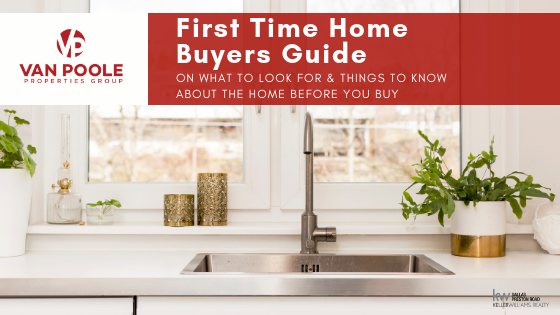 We’ve compiled a list from our buyer’s agents on the top things for you to know and you can download them directly here for safe keeping and easy reference when you’re out looking, on the go, or find a friend who is starting their first home buying process! We know that having an experienced real estate team in your corner can make a world of difference. So if you or someone you know is looking to buy their first home in the Dallas-Ft Worth area, whether in Plano or Denton, Southlake or McKinney, or anywhere in between or beyond, we are ready to help you. Not sure how to start the home buying process to begin with? Give us a call and we can help you at any stage of your home buying journey. You can always reach us at 214-267-9222, email us at info@vanpoole.com or connect here on this site. We look forward to talking with you! Does the home have a built-in microwave? Is there a dishwasher, and is the location convenient or have any surrounding cabinet design flaws? Is there a garbage disposal? How long does the water take to heat? Are there any room additions/garage conversions, and if so do they have heat/air conditioning? Are there shrubs around the HVAC system? Is there a mailbox? If so, where is it located? If not, what type is required by HOA if one exists? Are there Christmas light outlets on the exterior? Contact us today for one on one consultation and call 214-267-9222, email us at info@vanpoole.com or connect here on this site.